A pioneering number plate recognition system in Bradford played a vital role in the arrests of six suspects after the killing of Pc Sharon Beshenivsky. A network of CCTV cameras linked to a database of registration numbers automatically alerts officers to a vehicle's route across the city. Within minutes of Friday's shootings, police were using the system to track the suspected getaway car. The first arrests were made in London early the following morning. A West Yorkshire Police spokeswoman said: "This system played an important role from immediately after Friday's incident. 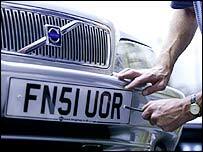 "Most forces in the UK use the Automatic Number Plate Recognition (ANPR) system as a patrol car-based method of checking vehicle identities. "In Bradford we have taken it a step further by linking this technology to the local authority's network of CCTV cameras which are monitored from a central control room. "When a car is entered on the system it will 'ping' whenever it passes one of our cameras, which makes it a lot easier to track than waiting for a patrol car to spot it." The system comprises a series of CCTV cameras at fixed points throughout the city centre and further afield on major routes in the outskirts of Bradford. At its launch in May, Ch Supt Geoff Dodd of West Yorkshire Police, said: "I believe that this is the best investigative tool we have had since the introduction of DNA analysis. "DNA broke new ground for the police service and this is another revolutionary tool in detecting crime. ""The importance of this system in the fight against crime cannot be underestimated. "Denying criminals use of the roads denies access to the primary means of transport for a whole raft of criminal activity. "It includes the transportation of drugs, stolen property and articles for use in crime, as well as transport for offenders to and from the scenes of crimes such as robberies and burglaries. "The bottom line is that if a stolen vehicle comes into or out of Bradford city centre we will know about it."